Children are treated differently than adults are with Chinese Medicine. Acupuncture needles are not used until the child is 7 or 8 and then, only one or two points for a short duration, and only if the child is willing. Why no acupuncture on kids until they're older? Their meridians and points are not fully formed until then. At City Acupuncture infants and toddlers are treated using craniosacral, tuina, and herbal formulas. Parents of young children are shown how to massage and clear their child's developing meridians to help resolve health conditions and support growth and development. Children are resiliant and receptive to treatment, requiring little intervention. 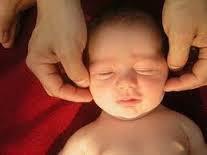 Older children are treated with craniosacral, tuina, herbal formulas and small seeds or beads on points. Simple point combinations are used to evoke a swift return to balance. Teens are treated with acupuncture, more like adults but with fewer points for shorter duration. They are treated with herbs, tuina and craniosacral as well. What pediatric conditions are treated using Chinese Medicine?